I downloaded a new (new to me at least!) app called Fitbit. It's a tracker that you enter everything you eat, plus it keeps track of how much you're walking, playing, anything that constitutes moving around. It even keeps track of your sleeping habits! 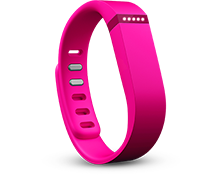 It's a bracelet kinda like the Nike one everyone had last year, but it goes instantly to your app to keep track for you. It comes in a ton of colors, but you know my ace would pick pink! They even have Tory Burch ones which I shall get once I order it. but what's the fun in that?! I definitely want to get the wristband to keep track of everything I do. So have you tried Fitbit yet?! Yeah that's why I want it too!